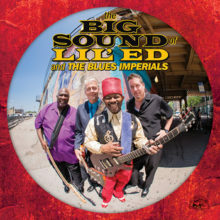 Celebrating their 30th year, Lil’ Ed & The Blues Imperials have established themselves as one of the most accomplished, longest-running Chicago blues bands of all time. The group released eight albums from 1986 and 2012 and won numerous awards including the prestigious Blues Music Award for Band of the Year in 2007 and 2009. The band’s lineup has remained the same for three decades with front man Ed Williams (lead guitar and vocals), Michael Garrett (rhythm guitar and vocals), James “Pookie” Young (bass) and Kelly Littleton (drums). By Jeffrey Zampanti, presenting the 17th season of Peanut Butter & Jam, in Kenosha, Wisconsin, where Lil’ Ed & The Blues Imperials will be performing on August 16. Read the full story in Kenosha News.